While I was travelling, I picked up a few goodies at the airport (Duty free!). If you're travelling through or to Singapore, definitely have a look at the cosmetics. Changi Airport offers many brands and is a lot cheaper than Australian prices. 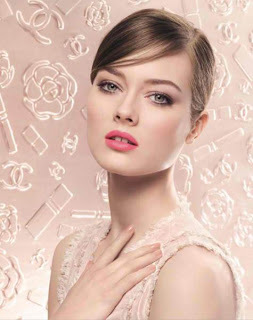 I've had my eye on this quad since it came out in the Printemps Precieux de Chanel Spring 2013 Makeup Collection. I myself, now have a tiny collection of Chanel makeup. I do want to pick up a blush at least from Chanel, but that's later on down the road. This quad, 39 Raffinement was released as part of this collection, however it is a permanent item. The overall feel of the quad is very neutral, all year around appropriate. Unfortunately, I can't upload the picture of the swatches for some reason. Temptalia has close ups of the swatches if you're interested. The lightest color ( top right ) is a light shell color with warm undertones. It has a frosted sheen finish. I like using this for the inner third/inner corner of my eye. It's not too light as to draw too much attention which I like. The top left color is a medium brown with very fine glitter. Has a slight purple hint to it, but its not too noticeable. Bottom left is a bronze shadow, and similarly to the top right colour, it also has a frosted sheen. Of all the shades in this quad, the colour payoff is the best. Highly pigmented yet not too frosty. Bottom right is a matte dark chocolate shadow. Nothing particularly special about it, just your standard dark brown shadow. The palette as a whole has a mauve undertone to it. With Chanel products in particular, there are regional differences. In Asia, Chanel eyeshadows tend to come in a baked shadow format, while in the US the eyeshadows are the standard pressed eyeshadows and are much softer in texture. Given this, the Asia region style shadows are still pigmented and relatively soft. Anyone who has used baked eyeshadows would know that they tend to be hard and more difficult to pick up with a brush. However, the Raffinement quad doesn't pose that kind of challenge. I imagine the US region style to be a lot softer though. I've had bad experiences with baked eyeshadows - with pigmentation and the way they're used up. Sometimes after using them for a while, it becomes more difficult to pick up with the brush. Sponge applicators work well if you're finding that brushes won't cut it. The sponge applicators that was provided in this palette felt cheap though. I feel that the Dior 5 Couleurs have excellent sponge applicators and that these Chanel ones just don't compare. They are better than the drugstrore ones though. I think it's a lovely quad and worth the pretty penny you pay for Chanel. However, it's not a must have. If you already have good quality neutral eyeshadows then you can probably skip this. If you're like me, and you don't like to go into half a dozen palettes to do your eye makeup, then this is a good quad to buy. It's also a nice quad if you're looking into buying your first high end designer palette.